Everyone deserves a theme – now it’s time for your team! Build a Team Song guides your team step by step to write, record and perform an amazing team theme song. 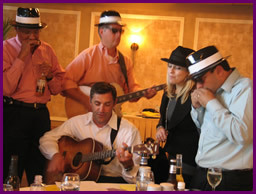 Each member of the team works together to build a fun and memorable team theme song. No musical experience is necessary. Quixote Consulting’s music team building facilitators guide you every step of the way – selecting a theme topic and musical style, writing some great verses, crafting a memorable chorus, finding the right rhythm, tempo, harmony and melody, and putting it all together in one amazing song that you have written! Professional musicians help your dream come to life right before your ears – you’ll be amazed at what your team is capable of and how much fun you can have in the process. Along the way, you’ll learn about different parts of a song and analyze what makes a song great. You’ll put your new knowledge to innovative good use immediately to create a work of art. Your song will stand as a powerful motivator that unites your team into action together with a common rhythm, theme and purpose. And the completion together of this musical project gives you a powerful template that can be used to tackle your upcoming project. Learn the secrets of the best songwriters in the world and apply them to your team and upcoming project when you Build a Team Song! This program includes a debrief of team performance around communication, working together, and project management by a trained facilitator. The debrief can be customized for your group goals. Half or full day. The program can also be incorporated into a multi-day program using work-style assessments such as MBTI and Strengthsfinder. A recording of your team theme song.